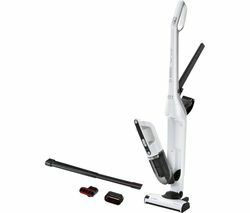 With a reputation for sturdy build quality and efficient functionality, Bosch vacuum cleaners are a steady bet when buying a new vacuum. Each Bosch vacuum cleaner we stock also comes with a 2 year guarantee as standard to give you peace of mind. The cordless Athlet range of Bosch vacuum cleaners all give you with between 40 and 60 minutes of cleaning time on a full charge - more than most similar models on the market - and will take 3-6 hours to fully charge from empty. With a 0.9 litre capacity they’re ideal for regular cleaning and their long charge should last for a full session of housework. If you’re in need of more cleaning capacity then you can enjoy up to 3-5 litres of space on other Bosch vacuum cleaners, meaning you’ll need to empty your vacuum much less often. For an alternative option, check out our Dyson vacuum cleaner range where each model comes bagless as standard for hassle free cleaning with minimal mess. From handheld mini vacs to super powerful suction models, Dyson’s technology continues to delight. If you’re looking for a cheaper option then our selection of Hoover vacuum cleaners give great value for money, with hand held vacs for under £35 and full sized models for not much more!